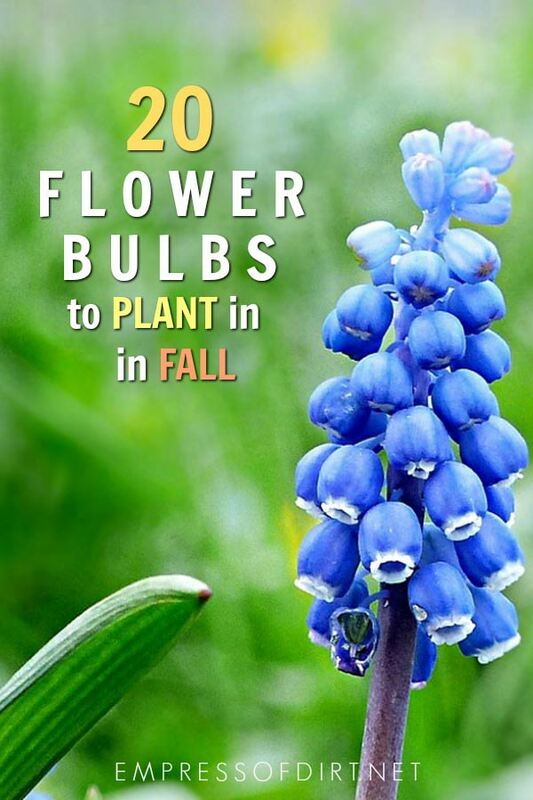 This is a list of flowering bulbs to plant in your garden in fall. They will bloom after winter, from spring to fall. 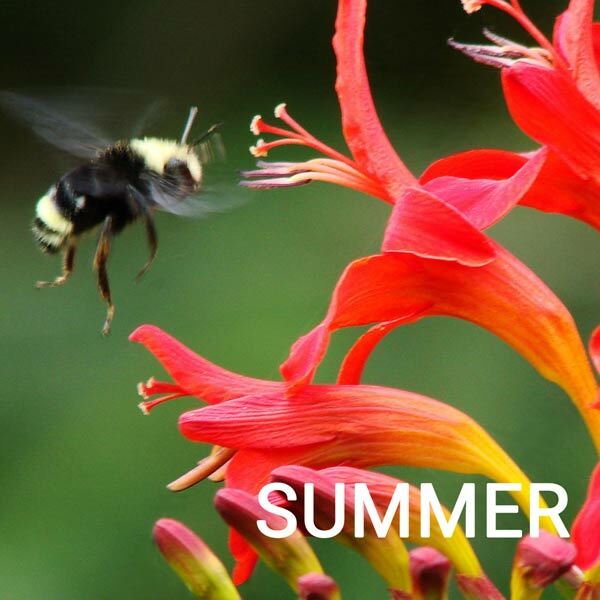 For more, also see 25 Flower Seeds to Sow in Fall and 20 Quick-Growing Veggies for Fall and Early Spring. I never regret taking time to plant flowering bulbs in the fall, probably because I forget about them, and, only when the shoots come up months later do I remember the beauty that is on its way. And that’s one upside to forgetting things, right? Plus, once planted, many flowering bulbs produce blooms annually for several years in a row, rewarding our efforts many times over. This list (below) is sorted by the time of year you would like the flowers to appear. Later winter flowering bulbs are always a treat, especially when it seems winter will never end. If I could only choose one though, it would be giant alliums, which bloom in spring. You can see allium bulbs here on Amazon.com. There are a few other things in bloom at that time but nothing as unique or dramatic. Plus, the bees seem eternally grateful to have them. 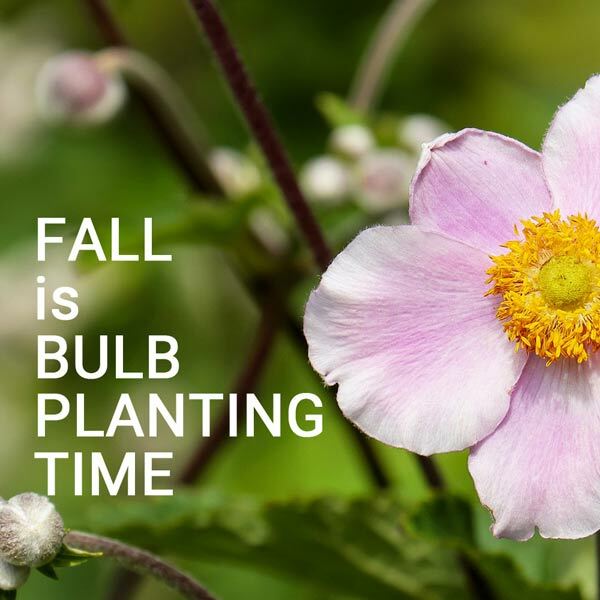 I’ll walk you through a few helpful tips and resources and then it’s time to order bulbs. Be sure you get them in time as most need to be planted a few weeks before first fall frost. There are 5 basic types of bulbs so you may see these various terms used on the packaging. 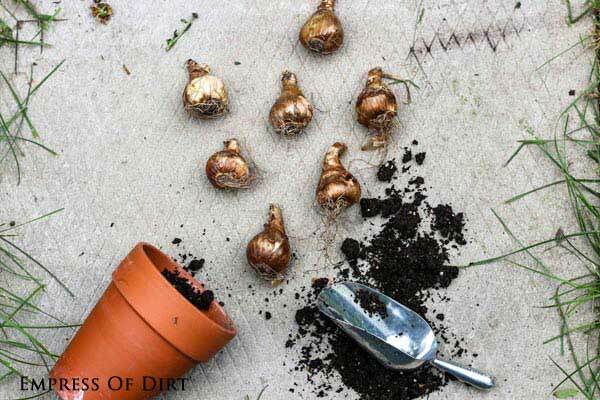 In general, the optimum time to plant bulbs in fall is when the soil is 60F/16C or cooler but before first frost. 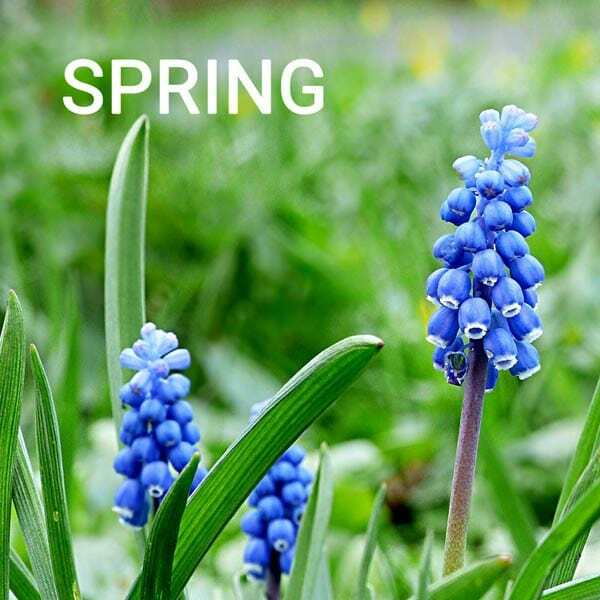 Many bulbs need 16 to 18 weeks of cold temperatures to produce blooms the following spring or summer. The ideal winter soil temperature during this time is 35-45°F | 2-8°C. Not that we’re going to check! 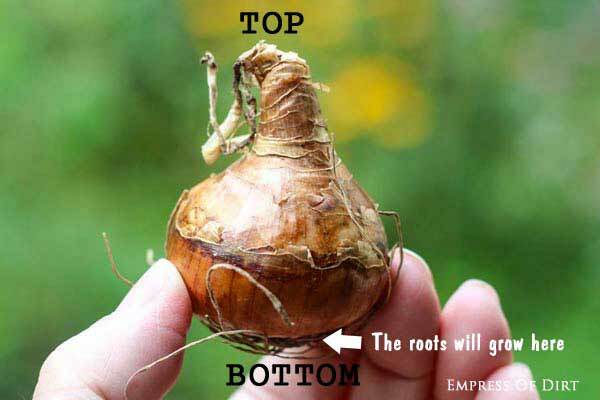 This also shares natural signs and signals indicating it’s time to plant fall bulbs. That said, check what the instructions on the package say as preferences vary with each bulb type. If you want to check soil temperatures, use a meat thermometer, and check the soil at planting depth. Measure at different hours of the day over several days to get the average. There is more on checking soil temperatures here. If you don’t want to take your soil’s temperature, find out your average first frost date and be sure to get them planted at least two weeks earlier. 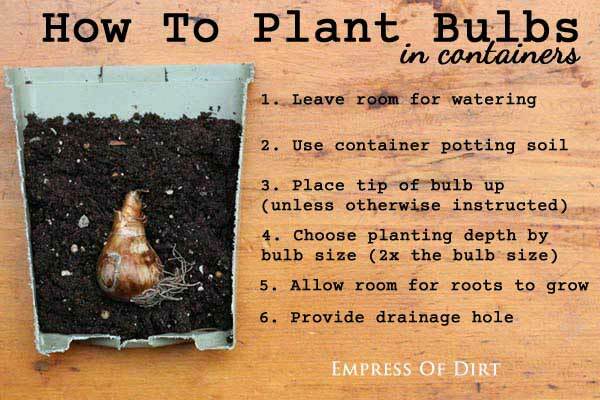 Bulbs can be planted in the ground or containers. If you use containers, it will take a few extra steps to help mimic the conditions nature provides. Here in southern Ontario, Canada, I plant bulbs in containers in September and October, and keep them in cold storage (where they cannot freeze) until March or April. In spring, I begin watering the container again and gradually introduce the bulbs to light and outdoor living conditions. I’ve listed the bulbs by bloom times. 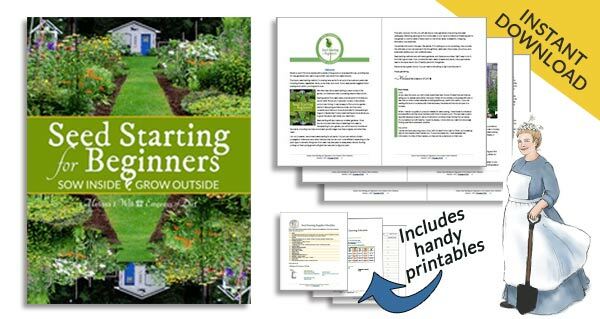 This is very handy for garden planning. Personally, I love having continuous blooms from spring to fall throughout my garden. You will also need to consider recommended growing conditions and light needs to make your selections. 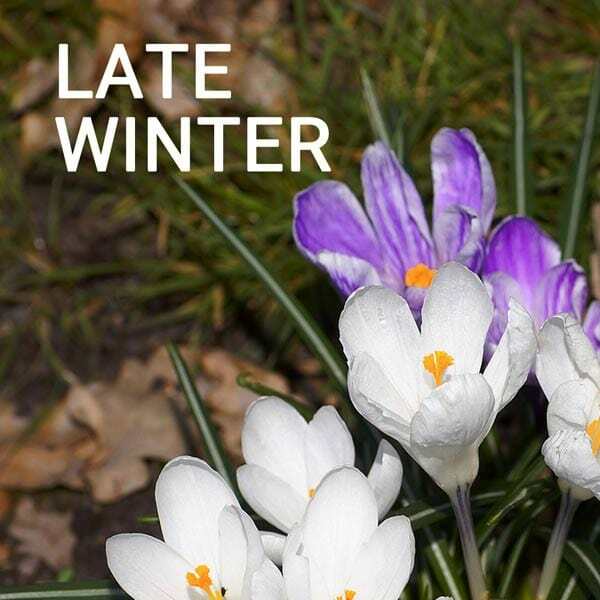 In cold climates, it’s the flowering bulbs like snowdrops and crocuses that start the show in late winter. Alliums are a top favorite for gorgeous, tall, dome-like flowers in spring and the bees love them. Siberian squill offers blankets of blue blooms. Crocosmia and lilies can be show-stoppers in summer. I have linked to examples of these bulbs on Amazon.com so you can see what they look like. Please note that some of the products shown are seeds not bulbs. Also, I always recommend you find a local source for purchases like this: find a local seller you like and trust and give them your business. You can find many good plant and seed sellers here (United States and Canada). • Allium (zone 5, bulb). Bees love them. Deer and rabbits hate them. • Crocus (zone 7, corm) Get Giant Dutch crocus if you want bigger flowers. • Crown Imperial Fritillaria (zone 3, bulb). Many animals don’t like the scent of the bulbs and stay away. • Daffodil Narcissus (zone 4, bulb) . Many daffodils are undesirable to squirrels, deer, and rabbits. Sadly, the only flowering bulbs they do not like to eat is daffodil Narcissus (zone 4, bulb). To reduce the number of thefts, I plant most of my bulbs in containers and cover them with hardware cloth until the they start to grow in spring. 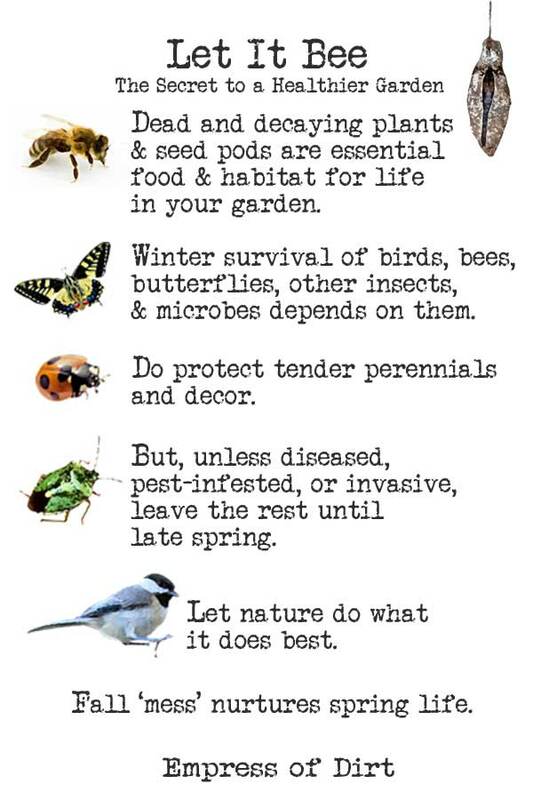 Now go plant some spring blooms! Empress of Dirt, I so enjoy your postings! I’m just wondering if there is any way that you could add a “print” option? So many times I would like to save your posts for future reference. I have a gardening binder that I keep these sort of things in. I guess I am old school in that way.